Nunans Florist & Greenhouse invites all the the annual Winter Open House on Sunday, November 29th! It is the perfect time to select your Christmas tree, take your family picture with Santa and enjoy all the holiday decorations and music throughout the store! 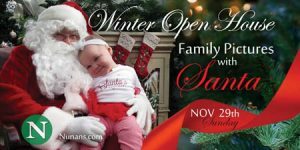 Get your family photo taken and visit with Santa!